With huge budget deficits, massive debts, unsustainable entitlement spending, and rising tensions between the public and private sectors, the United States economy has never been more dominated by the collision of business and politics. 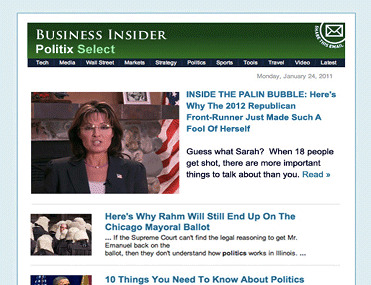 So we’re pleased to announce the launch of Politix and the Politix Select newsletter to cover all this in detail. Politix Select is a daily roundup of top headlines, analysis, and video covering the intersection of politics, money, and business.